In the first five months of 2014 more than 47,000 unaccompanied minors were detained whilst trying to enter the US illegally. The influx has posed a political as well as humanitarian problem for Obama administration. Eager to score political points, Republicans claim that the current crisis is the result of the Obama administration’s lax policy migration, and particularly the Deferred Action for Childhood Arrivals (DACA) program. The surge in unaccompanied Central American children and adolescents who are arriving at the US southern border has generated an unprecedented humanitarian crisis with detention facilities now severely overcrowded and scores of children arriving sick and dehydrated. According to US official figures, in the first five months of 2014 more than 47,000 unaccompanied minors were detained whilst trying to enter the US illegally by crossing the south-western border of the US, a year-on-year increase of 92 percent. Most of the children come from El Salvador, Guatemala and Honduras, a growing number are under the age of 12, and during their hazardous journey to the US — in most cases in search of their parents — many of them are vulnerable to crime and sexual abuse. On June 15, the decomposing corpse of a young boy was found 32 kilometers (20 miles) west of McAllen, Texas. Five days later, he was identified by the Texan police as 11-year-old Gilberto Francisco Ramos Juárez, from the Northern department of Huehuetenango, in Guatemala. He was travelling alone to the US to join his older brother who lives in Chicago. The harrowing discovery highlights the dangers faced by unaccompanied child migrants. “We’ve heard testimonies of teenage girls who take contraceptives during the journey because they know they can get raped. There have also been cases of children who have been killed or kidnapped by Los Zetas [Mexico’s most dangerous drug cartel] along the way,” says Flora Reynosa, the Guatemalan Displaced People and Migrants’ Ombudsperson, to Latinamerica Press. In an attempt to find a solution to the crisis, US vice-president Joe Biden extended his trip to Latin America which was scheduled to end on June 19 and scheduled a last minute visit to Guatemala the next day where he discussed the issue with Guatemalan President Otto Pérez Molina, Salvadoran President Salvador Sánchez Cerén, Mexico’s Interior Minister, Miguel Ángel Osorio Chong and the coordinator of the Honduran cabinet, Jorge Ramón Hernández. The influx of child migrants has posed a political as well as humanitarian problem for the US president Barack Obama administration. 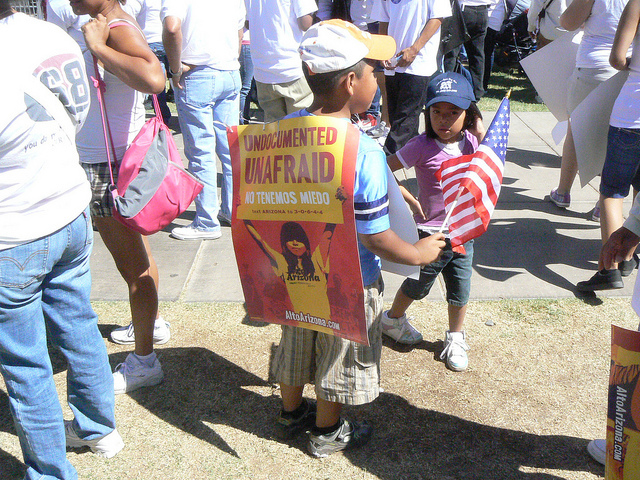 Eager to score political points, Republican opposition leaders have argued that the current crisis is the result of the Obama administration’s lax policy migration, and particularly the Deferred Action for Childhood Arrivals (DACA) program, under which deportation can be deferred for some minors that enter the US illegally and have lived there for a number of years. During the talks, Central American leaders insisted that the children’s welfare and their right to be reunited with their parents should prevail above all other concerns, whereas Biden, on the other hand, urged them to dispel the myths that have arisen regarding the US government’s migration policy with regards to unaccompanied minors. “Make no mistake, once an individual’s case is fully heard, and if he or she does not qualify for asylum, he or she will be removed from the United States and returned home. Everyone should know that. We are prioritizing the need to resolve these cases as quickly as possible in light of the humanitarian crisis. We expect many of the recent migrants to fall into this category. My guess is a vast majority, and they will be going home,” said Biden during a press conference held at the residence of the U.S. ambassador to Guatemala. “All of us agreed to work to counter and correct the misinformation smugglers are propagating about US immigration policy, and discourage families from sending their children on this perilous journey. The President of Guatemala announced that beginning in July there will be a major initiative in the media and in the public space here in Guatemala to make it clear what the facts are. The same commitment was made by the President of El Salvador and the Honduran representatives. Mexico is already doing this. We expect them to do it. We will hold them to that commitment,” he added. Seven days after Biden’s visit, Guatemala’s largest media conglomerate which includes Prensa Libre, a national newspaper, the Guatevisión TV channel and regional newspaper El Quetzalteco,launched a campaign warning the population of the dangers of allowing children to travel to the US illegally and unaccompanied, and urging the government to improve security, education and employment opportunities for young people, in the hope that better living conditions at home will discourage young people from emigrating. However, the National Commission for Migrants (CONAMIGUA), a government bureau that lobbies in favor of migrant rights and assists migrants living abroad as well as deported migrants, has also urged the US government to provide the necessary resources to process the cases of undocumented migrants in a swift and efficient manner. According to CONAMIGUA, the US justice system currently only has 260 immigration judges spread across 59 tribunals where 300,000 immigration cases are awaiting trial. *The fiscal year runs from October 1 to September 30. Are young people fleeing from gang violence? Eager to deflect attention from the controversy over migration reform in the US and immigrants’ right to be reunited with their families, Biden emphasized gang violence in Central America as the number one cause of child migration and pledged US$40 million to fund social programs that seek to prevent vulnerable youths from falling prey to street gangs such as Mara Salvatrucha and Mara 18. The United Nations estimates that there are around 60,500 gang members in the three countries that comprise what is known as Central America’s Northern Triangle: Guatemala, Honduras and El Salvador. However, although youth gangs and drug trafficking are often cited as the main causes of violence in the region, there is debate as to whether the problem has worsened so dramatically over the past five months so as to cause a 92 percent rise in child migration. Guatemalan ambassador to Washington, Julio Ligorría, describes child migration as “a phenomenon that has multiple causes,” which includes poverty, high levels of youth unemployment, children’s natural desire to be reunited with their parents, and widespread violence. On the other hand, José Guadalupe Ruelas, director of Casa Alianza Honduras, an NGO which defends the children’s welfare, says that in the case of Honduras, claiming that violence is causing young people to flee by the hundreds is by no means an exaggeration. And when he talks about violence Ruelas refers to both gang turf wars and so-called “social-cleansing” operations, that is to say the elimination of groups regarded as “undesirables,” such as gang members or simply young people who loiter in the streets, by vigilante groups. “Hondurans are not looking for the American dream; they’re fleeing from the nightmare of violence in Honduras. So far this year 102 children have been executed and six massacres have been reported. There are financially powerful vigilante groups that have cars, arms and wear balaclavas, and they’re murdering poor children in Honduras,” says Ruelas to Latinamerica Press.— Courtesy Latinamerica Press. “Migrant Trails, Trails and Travails. Arizona and California. March-April 2014. Next A New Normal for Iraqi Kurds?